Operations under Parks, Recreation and Natural Resources include expanded hours, new parking pay stations and a commitment to improved maintenance at the waterfront facility. HUDSON – SunWest Park is officially under new management. Pasco County Parks, Recreation and Natural Resources assumed day-to-day operations as of Oct.1. The Pasco Board of County Commissioners approved an amended lease agreement with the previous operator, the Lift Adventure Park. SunWest Park is a recreational waterfront facility in northwest Pasco, just off of U.S. 19. 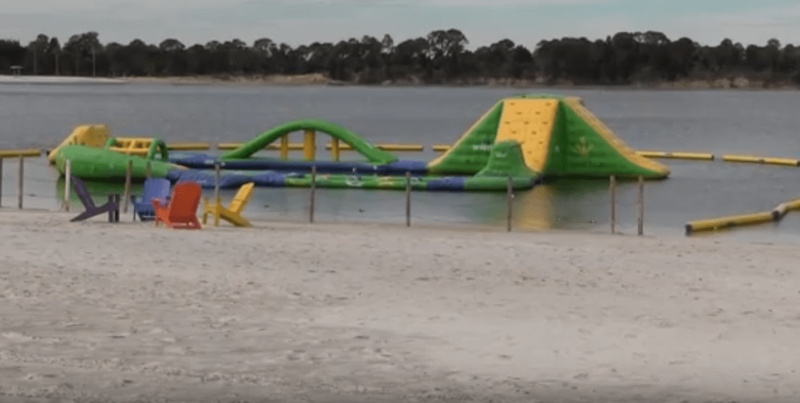 The park has been developed around a former limestone mine, known locally as “SunWest Mines.” Gracing the shores of the 70-acre spring-fed lake is white sand that creates a beach atmosphere. Operations under Parks, Recreation and Natural Resources will include expanded hours from sunrise to sunset, as well as new parking pay stations and a commitment to improved maintenance onsite at the popular, recreational waterfront facility. The Lift Adventure Park will continue to provide a variety of amenities at SunWest, including the world-class wake boarding cable system, paddle sports and an updated and expanded aqua park. Two dozen beach volleyball courts, space for sand soccer, and the ability to host water ski teams and more makes SunWest a key sports tourism asset for the county, officials said. SunWest Park is located at 17362 Old Dixie Highway in Hudson. For information, go to Pasco County Parks, Recreation and Natural Resources. For a video of the park, featuring Mariano, go to youtube.com. Photos are screenshots from Pasco County video. Courtesy of Pasco County.